Quick question my friends !!!!!!!!!!!!!!!!!!!!! is the adapters ok for what our teeeeerucks do!! im not talking about the aluminum alcoa or anything like that i am after being very diff.. so having said that i can get a set of 22.5 steels from a great dane trailer for the low low cast of FREE!!! Last edited by PureLuck88; 06-03-2010 at 11:45 PM. I bet the tires are pricey..
well you can get a wanli (china made)tire for about 200 a tire. Well thats not too bad really. No it's not really that bad I bought 8 for my last semi truck and they lasted around 240000 miles haulin 80000lbs still good tread when I sold it. Last edited by PureLuck88; 06-04-2010 at 12:08 AM. Good looking truck, i was thinking about the low pros that they are running with now, i bet those are a bit more than 200 bones a tire..
nice drawing but its upside down. with the steel 22.5s they are very heavy. I dont think ull get the 11r22.5s under a 2 wheel drive they are very tall. You can only go so high with a body lift and there are not many suspension lift options for 2wd 80s truck. Personally i think it will be real hard on brakes since the wheels and tires will be really heavy. Not to mention the added weight of the adapters which are heavy by themselves. you hve to remember the stock tire diameter is about 32"
Is there a additional 5" in every direction. Also what about the offset? You could add them but you would be body lifting, custom suspension widening the wheel tubs and the rear fenders, and may be shortening the rear axle. All doable things but it sounds like a lot of mods. I found a set of 19.5" bread truck rims and will be putting 225-70r19.5 on them and that will make the truck look like yours picture. Last edited by BGRAFX; 06-04-2010 at 09:21 AM. 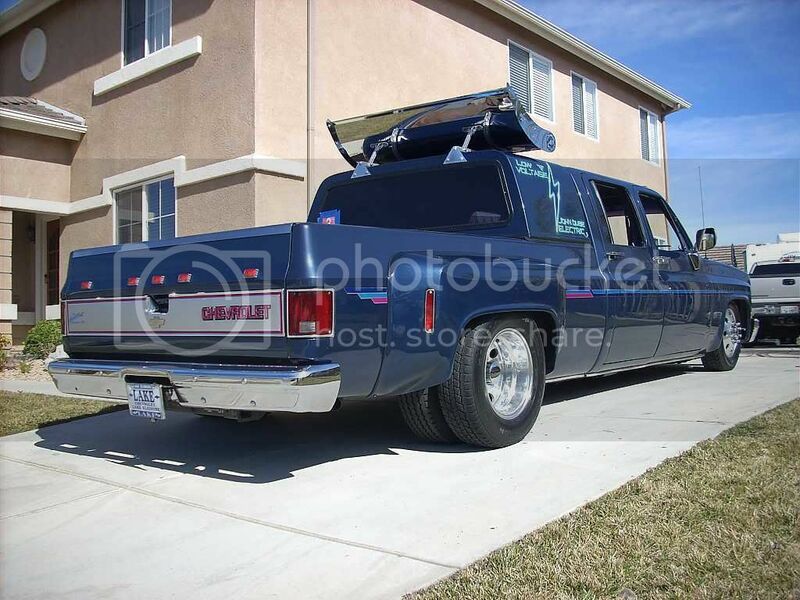 I bouugt the 81 Dually on my 21st birthday 1987. It was beat up a little. The paint and body took 6-months and nearly $10K in 1989. My old buddy Dave W. at Fabtech notched the frame just a little and in installed air bags. I also used it to tow a 28' Weekend Warrior, had a custom goosneck hitch for my truck only. Interior was OK, just ran out of money and had to move on. The engine compartment also wasn't finished. It was just a sunday driver for the last 10 years. Enjoy, I sure miss that truck. Chicks Dug It! Took a day trip through Banff and Jasper with the wife and kids.. check out the old gas pump still in operation! Here's my updated 2toned truck! is that just a flat black?